Jennifer, our delightful and talented editor at 5 Minutes for Books had a fabulous idea for a Back-to-School Giveaway and we've been working really hard at finding and presenting you with opportunities to win some really good stuff! Jonathan, my talented and-generous-with-his-time husband, created a set of buttons for us and away we go! Visit us at 5 Minutes for Books for the next few weeks and see what we're doin'. I'm rather excited about the first contest because it's mine. =) AND I really like it, too. Really, really like it. 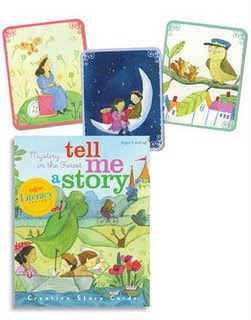 To win a set of Tell Me a Story cards from eeBoo CLICK HERE.